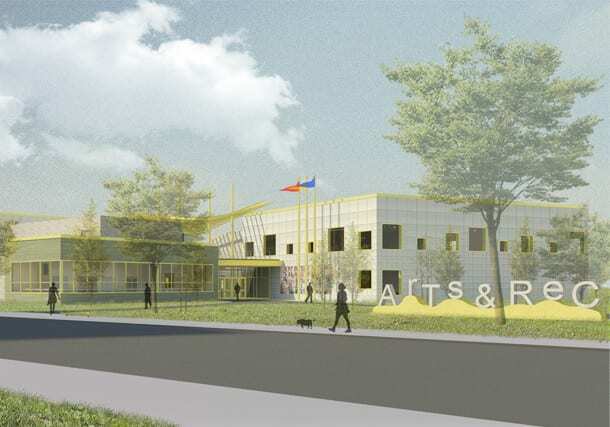 The new Arts and Recreation Center located at 35th and Cottage Grove in the Oakland neighborhood will serve the greater Oakland, Douglas, and Bronzeville communities. Sited within Ellis Park, the two-story, 32,000 square foot field house is designed around a central lobby on axis with South Vincennes Avenue which directly connects with the Oakwood Shores community to the south. Located on a triangular site, the gymnasium, indoor swimming pool, fitness room, and club rooms are rotated about a central point that makes all functions visible from the lobby and responds to adjacent streets and approaches to the building. A roof deck covered by a sculptural trellis provides an outdoor gathering space with views of the park. Environmentally conscious design features, including a green roof, rain garden and solar thermal hot water system, help enhance the building’s sustainability.